Shares of the small cruise line seem poised to set sail. Despite a drop earlier in the year, shares of Norwegian Cruise Line Holdings (NYSE:NCLH) are sporting a 70% return since the summer of 2014. In that same time period, the broader stock market has had a less than stellar performance. What factors have contributed to the stock's advance, and will it continue? 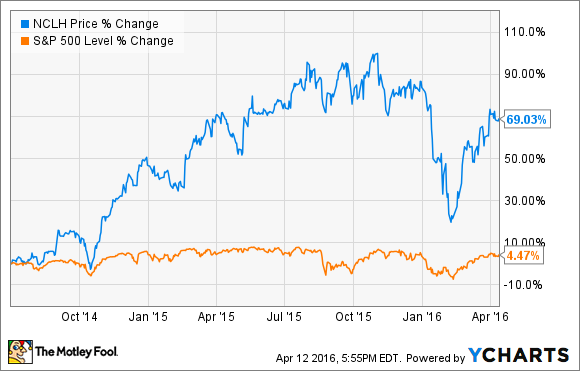 Does the cruise line have enough growth left in the tank to float higher stock prices? Here are some positive expectations. First, the company just acquired a new cruise liner this month, and has a second one on the way later in the year. Management expects three more ships to be acquired through 2019, bringing the fleet count up to 27.